The Cessna Citation Sovereign is a midsize corporate jet that can comfortably seat up to 8 and is the ideal aircraft for medium domestic and short international aircraft charters. It is piloted by two experienced Captains, and is capable of cruising speeds of 460kt (850kph). 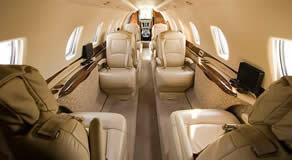 It has a full leather interior and separate toilet, and a flight range of over 4000km.